The Be-Ge Group Group has a successful and interesting history that we are very proud of. Here is a timeline from 1934 to today. 1934 Bror Göthe Persson took over the import and sales of Ford motorcars in Oskarshamn. He was somewhat of a visionary with an early insight of the importance of motorization. 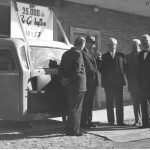 1941 Be-Ge Bil became sales agent for Scania Vabis trucks and is today the world’s oldest Scania agent. 1946 Be-Ge Karosserifabrik AB was established. 1949 Was the first modern suspension seat for transportation developed..
1951 Be-Ge Bil became a dealer of Volkswagen. 1962 The expansion continued and a factory was built for the manufacture of truck cabs in the Netherlands..
1966 The coachwork factories were acquired by Scania Vabis in Södertälje. The manufacture of truck cabs is still in Oskarshamn and is one of Kalmar County’s largest employers. The manufacture of the driver seats in the truck cabs remained as a Be-Ge production. These activities continued in the new company Be-Ge Stolindustri AB, which today is Be-Ge Industri AB. 1987 Be-Ge Förarmiljö AB was formed in Kolsva specializing in the sales of driver seats and equipment for forestry machines. 1990 The seat manufacturer Nyström Nordpatent AB in Umeå was acquired giving Be-Ge Industri AB a wider product programme with bus and truck seats and also office chairs. 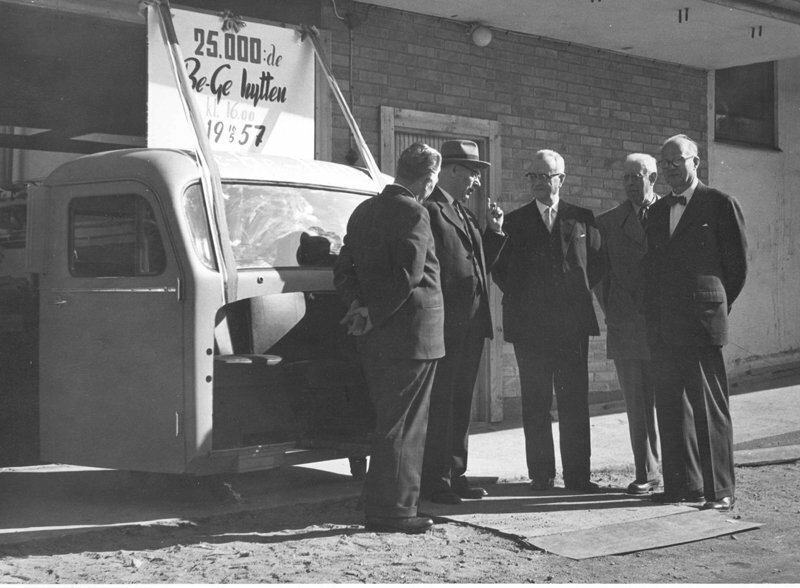 The same year Bil & Maskin AB in Vetlanda was purchased, which increased the region for the sales of cars and trucks. 1993 Be-Ge Traktor & Maskin i Åstorp AB started and became the general agent for Zetor tractors and Agrostroj agricultural machines. In the same year Bilcenter AB in Oskarshamn was established for the sales of Seat, later on also Skoda cars. 1996 Be-Ge Industri AB was certified in accordance with ISO 9001. 1999 The vehicle companies were certified in accordance with ISO 9002. 2000 The activities in Umeå were moved to Oskarshamn and the industrial facilities in Umeå were sold..
2001 Jany Scandinavia A/S and Vald. Nielsen & Son A/S in Denmark and also Oskarshamns Plåtindustri AB were acquired. 2002 Billackeringen E. Johansson AB in Oskarshamn was acquired as a future development of vehicle and industrial paint work. 2003 The two Danish companies Jany A/S and Vald. Nielsen A/S were merged and the Copenhagen office was closed down. The same year the rights were acquired to market the office chair called “Ullmanstolen”. 2005 The vehicle plant in Oskarshamn has been extensively enlarged. Be-Ge Traktor & Maskin i Åstorp AB got sold. 2006 Be-Ge Företagen AB acquired 80 % of the Lithuanian company UAB Amersanas and 1/3 of the industrial company Stece AB in Mönsterås, Sweden. Be-Ge Seating UK Limited is established in Coventry, England. 2007 Be-Ge Företagen AB increased its shares in Stece AB to 50%. 2008 Be-Ge Amersanas UAB and Be-Ge Stece AB became wholly-owned subsidiaries of Be-Ge Företagen AB. 2009 Be-Ge Personbilar AB 75 years. Be-Ge Fastigheter AB is established. 2010 The partly-owned Be-Ge Förarmiljö AB got sold and the name got changed to Förarmiljö i Sverige AB. 2012 A new service centre for Scania opens in Hultsfred, Sweden. 2014 Be-Ge Industri AB acquires 80% of Savas Seating B.V. in Zaltbommel, the Netherlands, including the subsidiaries Savas Qualitätsitze GmbH in Germany and Savas N.V. in Belgium. 2015 Savas Seating B.V. with subsidiaries became wholly-owned subsidiaries of Be-Ge Industri AB and the name is changed to Be-Ge Savas Seating B.V.
2017 Frysen Invest AB with the subsidiaries Visby Tunga Fordon AB and Visby Fordonfinanas AB are acquired, whereby the region for trucks is expanded within the county of Gotland. The property Järneken 5 is aquired to ensure future assembly capacity for vehicle seats in Oskarshamn. 2018 The companies Frapett Produktion AB and Mönsterås Pressdetaljer AB, both based in Mönsterås, Sweden are acquired.